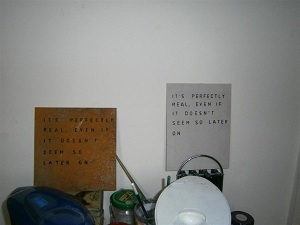 IT’S PERFECTLY REAL, EVEN IF IT DOESN’T SEEM SO LATER ON (2012) is a small sign produced in a numbered, unlimited edition of individually unique copies. All examples contain identically the slogan of the title but vary from one to another in terms of dimensions, design and materials. It may be a useful sign to hang up in the home, perhaps, or at one’s place of work. This piece is offered free of charge to anybody that wants one – just ask the artist.